There’re counter seats and some tables. Not only its appearance but also their interior had good atmosphere. I remember many ramen shops had such atmosphere when I was a small girl. 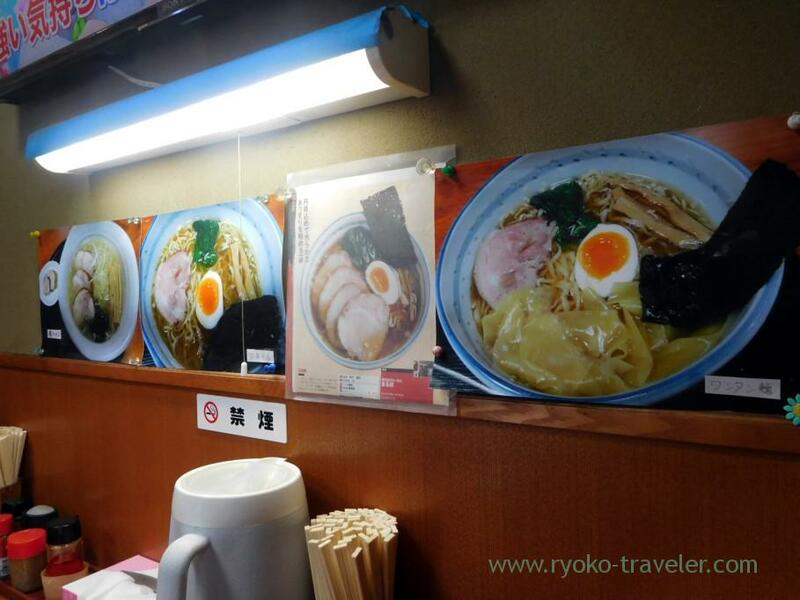 The shopkeeper worked in a ramen shop in Shirakawa area. 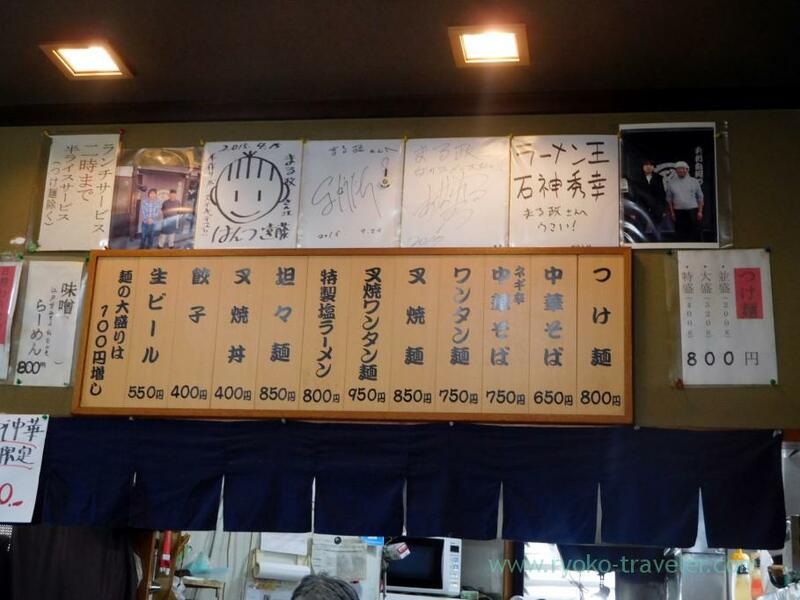 So, we can have local Shirakawa ramen at the shop. 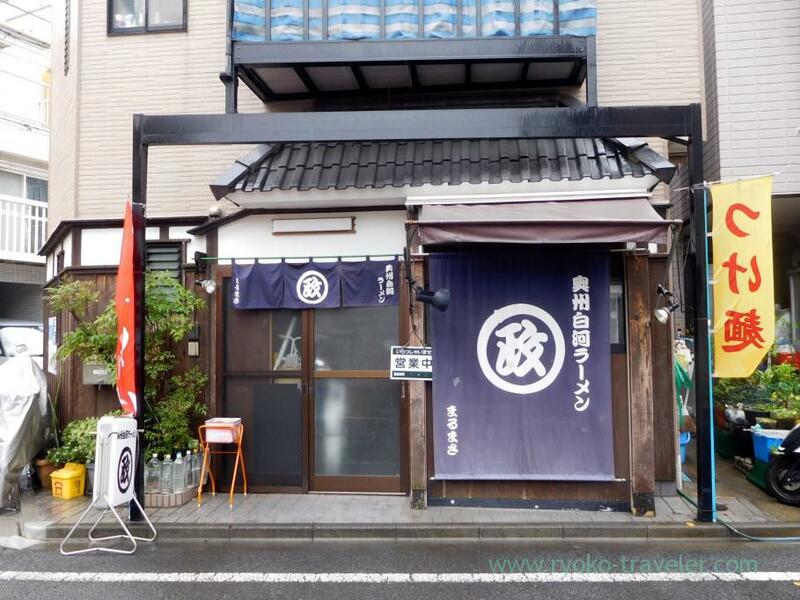 They are located in the residencial area and it takes about 10 minutes walk from JR Hirai station. It’s far a bit. I ordered after I was seated and paid when I got out from the shop. 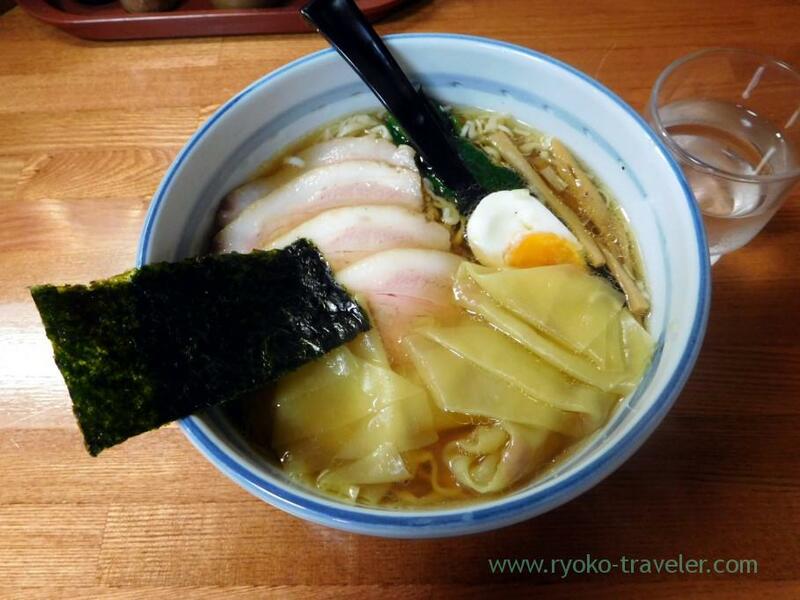 Not only Shirakawa ramen but also they serve tsukemen, tantanmen noodles, miso ramen and so on. 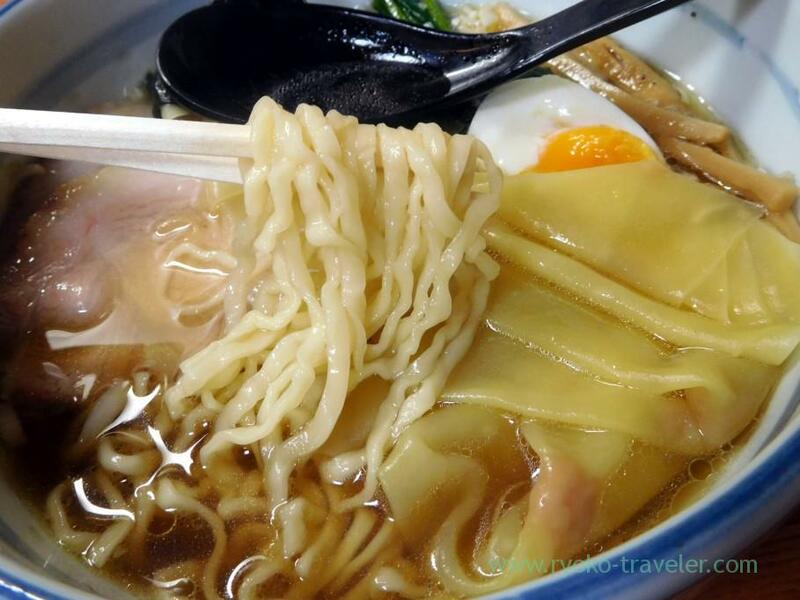 The most expensive ramen is Wonton noodles with roast pork. But it cost only near 1000 yen. Inexpensive ! And they serve half rice until 2:30 p.m. without fee. Saturdays, too ! They ask us whether we need rice or not when they take order. I ordered the most gorgeous ramen in this shop. 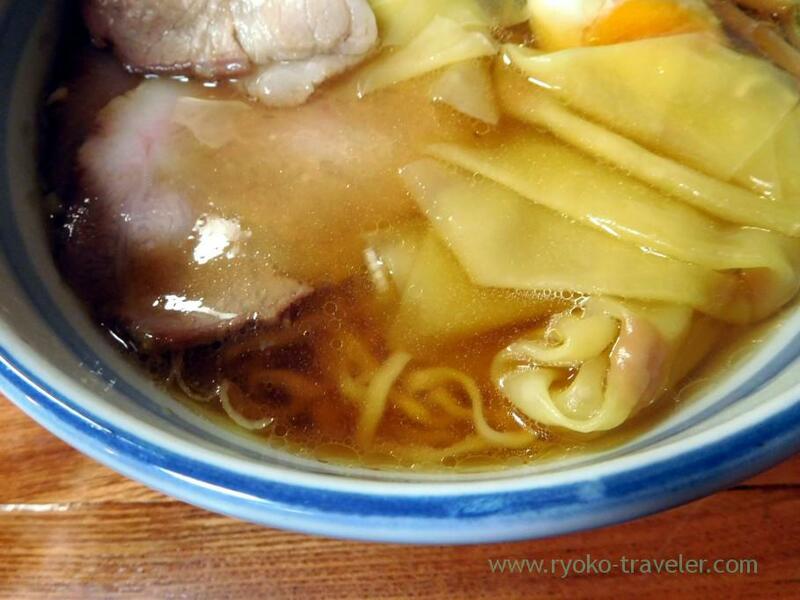 Wonton noodles with roast pork (叉焼ワンタン麺, 950 yen). At first, its looking is beautiful ! Transparent soup having soy sauce had refreshing tastes. It had abundant broth of chicken. Chicken fat, too. So, though it had refreshing tastes. it also have rich tastes of the chicken. The ingredients are, four pieces of roast pork, wonton, laver, half of half boiled egg, bamboo shoot, green onion, spinach. Curly noodles was soft and went with the soup very well. These wonton didn’t have much fillings, but the texture of the wonton was awesome. The roast pork was soft and juicy. It had much fat. But it wasn’t greasy and I could with easy. It’s simple and good ramen. I think I can eat it everyday. Open / 11 a.m. – 2 p.m., 5 p.m. – 8 p.m.
Toyosu Market : Blue sky, green grass, and Tokyo Tower ! Fine view from the rooftop !